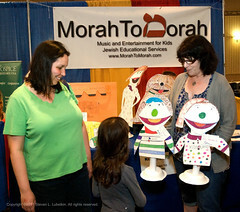 Morah Judy, right, shows puppets to a young visitor to the Morah to Morah booth at Kid's Land. Morah to Morah is Judy's new Jewish educational and musical entertainment venture. Our new wholly owned subsidiary, MorahToMorah LLC, made its debut on Sunday, May 15 at the Kid’s Land Expo held at the Katz Jewish Community Center in Cherry Hill. Morah Judy Lubetkin showed off her puppets, performed on the guitar, and introduced parents and children to her new Jewish educational and musical entertainment business. Also on the program was a mini rock concert performed by the kids who study at the School of Rock. You can see our images from the event at Flickr.com.